The Hofstra Observatory, partially supported by a grant from the National Science Foundation, includes Celestron telescopes and computerized CCD cameras. The Observatory is located on the roof of Herman A. Berliner Hall (Chemistry and Physics Building). - Registration is now closed for the following 2019 events. Feb. 3, 2019 6-8 p.m..- registration is closed for this event as 150 people have already registered. Mar. 3, 2019 7-9 p.m.- cancelled due to the weather. Apr. 7, 2019 8-10 p.m.- registration is closed for this event as 150 people have already registered. Hofstra invites kids of all ages to view the Moon, Jupiter, Saturn, Mars, Venus, star clusters, nebulae, & double stars with telescopes from the Hofstra Observatory, 4th floor, Berliner Hall, California Ave. & Huntington Place, S. of Hempstead Turnpike. Program begins with a presentation about the sky in room 117. Attendance is limited to 150 people per event. Dr. Donald Lubowich, Coordinator of the Astronomy Outreach Program at Hofstra University, will give concertgoers a spectacular glimpse of the heavens. This Hofstra - sponsored program will include solar, optical, and radio telescope observations of the Sun and Moon prior to the concerts and of the Moon, Venus, Mars, Saturn, Jupiter, multi-colored double stars, star clusters, and nebulae at intermission and after the events – combined with videos, posters, banners, and hands-on-activities for all ages. Wednesday July 25, 2018, 7:00 - 10:00 pm; “Summer Wind” with the smooth sounds of Johnny Avino, Sounds of Frank Sinatra & Friends; Rath Park, Franklin Square, concert at 8:00 pm. Saturday August 11, 2018, 6:00 -10:00 pm; Latino-American Night, Eisenhower Park, East Meadow, NY; Harry Chapin Lakeside Theatre, concert at 7:00 pm. Friday August 16, 2018, 6:00 - 11:00 pm; Family Cinema Night -- A Wrinkle In Time; Jones Beach boardwalk bandshell, Central Mall Jones Beach State Park, Wantagh, NY; movie at 8:00 pm. Saturday October 6, 2018, 8:00 - 10:00 pm; Sagamore Hill National Historic Monument, Oyster Bay, NY. Since 2009, this NASA-funded Music and Astronomy Under the Stars program has brought the stars to 50,000 music lovers at Long Island parks and to the Newport Folk, Tanglewood, and Ravinia music festivals with the assistance of local astronomy clubs. Yo-Yo-Ma and the Chicago Symphony or Boston Symphony Orchestras, the McCoy Tyner Quartet with Ravi Coltrane, Esperanza Spalding, Phish, Blood Sweat & Tears, Deep Purple, Patti Smith, Tony Orlando, and Wilco have performed at these concerts. The Amateur Observers' Society of New York is a partner with this program and has telscope viewing in July and August at the Jones Beach Nature Center and at Sagamore Hill National Historic Monument, Oyster Bay, NY. For info visit www.aosny.org. Over the past thee years, Hofstra's Astronomy Outreach Program has also brought the wonder of star-gazing to hundreds of children and adults at Long Island schools, hospitals, non-for-profit groups, parks, beaches. 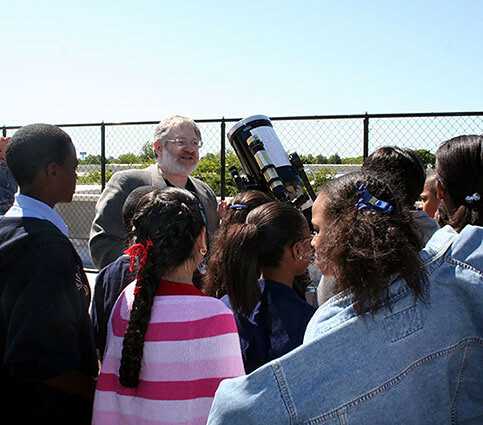 In 2009,the program, under the direction of Donald Lubowich, Ph.D., will expand its offerings with the help of a $308,000 NASA grant, bringing telescopes to Long Island parks and beaches to encourage interest in astronomy. This is the third consecutive year that the program has been awarded a NASA grant. The Observatory is located on the roof of Herman A. Berliner Hall (Chemistry and Physics Building), at the intersection of California Avenue and Huntington Place, two blocks south of Hempstead Turnpike. The Hofstra Observatory is a facility of the Department of Physics and Astronomy at Hofstra University.